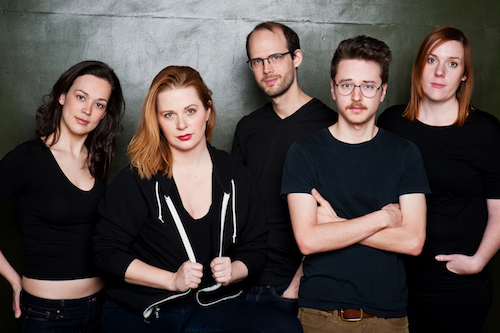 Everything Else is Sold Out, this year’s Toronto Fringe Festival offering from the almost-unGoogleable sketch comedy troupe Dame Judy Dench, marks the group’s third Fringe outing after last year’s well-reviewed That’s Just 5 Kids In a Trench Coat! Playing at the Helen Gardiner Phelan Playhouse, the show entices with a risky, self-deprecating title. It’s also an ironic one, as this well-crafted, sharply hilarious set of sketches promises to deservedly be one of this year’s hottest tickets. Everything Else is Sold Out is a freewheeling ouroboros of a sketch show, eating its own tail and displaying a world where it seems anything can happen — but it’s all eminently logical. It often dips into the realm of mythology, blurring the line between the fantastic and the everyday with wonderful results. A lonely vampire dances to the bossa nova to attempt to please a houseguest. The witches from Macbeth have a hard time scheduling their next spell. A “get off my lawn” speech reaches new heights of absurdity. A new currency is introduced. A caveman wrenched from the past has a hard time with icebreakers, and Narnian math just doesn’t make any sense. The incongruities get howls of laughter. In fact, what Dame Judy Dench does in using the mythic to explore the weirdness of our own reality is ideal. It works in the same way that using specifics helps us universalize and connect concepts to ourselves, while generalities prove boring. This show is always specific and never boring. It’s adult without being raunchy, pointed without being crude, and modern without leaning too heavily on reference or cliché (though a sketch about a new form of Uber gets one of the night’s biggest laughs). The pacing and construction are top-notch from beginning to end. Callbacks arise and threads are woven through the hour, and the troupe seems to have an instinctive knowledge of exactly where to button a sketch. The delivery and physical work are both extremely polished (wait for the dance sequence. Trust me). Everyone deserves kudos for managing to keep a manic intensity while varying it to character specifics. It’s all very funny, but that isn’t to say there aren’t moments of poignancy, including a couple of sizzling potshots at society’s expectations of women. I particularly enjoyed the moment a young woman decides to drop out of the arms race that is collecting markers of adulthood; I’m pretty sure I saw nods of recognition throughout the audience. If you’re worried about the “audience participation” warning, don’t let that stop you. It’s very mild; just sit further back. Honestly, I didn’t really want the show to end. With the snake seemingly delighted to bite its own tail, maybe it doesn’t have to. Tickets are $12 at the door or in advance, and can be purchased online, by telephone (416-966-1062), from the Fringe Club at Honest Ed’s Alley, and — if any remain — from the venue’s box office starting one hour before curtain. The festival also offers a range of money-saving passes for serious Fringers. Content Warnings: Gunshots, Audience Participation, Mature Language.